As I was saying yesterday E and I have been babywearing at home more which is really helping me to be more active at home. Now we have a number of different carriers including slings, wraps and soft-pack carriers and they have all been great at different ages and activities. Currently Neil and I have been wearing the Boba Carrier the most as it is the newest that we have added to our collection and I am really loving it. As with anything there are pro’s and con’s and the Boba Carrier is no different. I love the pattern of the Boba. We chose to go with the bird pattern because it seemed fitting with our “Put A Bird On It” theme for E’s nursery (yes that is a Portlandia reference). I love the fit of the Boba and how it wears. I find that after awhile most carriers start to bother my back (need to work on strengthening my core) and while the Boba does start to bother it after awhile it usually takes longer than other carriers. The bag strap. This strap holds E’s diaper bag or my purse in place on my shoulder without having to hold it there. Rain/Sun Cover. This is a must with E because it protects her from both but it also is great when she is tired and needs a nap. As soon as I see those heavy eyes I put the cover up and she passes right out. The phone holder. On the front of the Boba Carrier there is a pocket that fits my iPhone perfectly and is great for easy access. The length of the straps to tighten the Boba once it’s on are a little short. I do okay with the length but Neil on the other hand has a different frame and is unable to tighten the straps without my help. Lacking a good sized pocket to hold phone, keys and change purse. This is a big down for me because when I go out for a walk I often wear leggings and I don’t have a pocket to hold things in. Like I said above there is a small pocket for a phone and there is a tiny pocket on top that could hold my keys but that’s it. The infant hold. I don’t love the infant hold which you can see here. I wore E in it for a few times but the fit was just really uncomfortable and frankly an unflattering look on me. I ended up changing it back to the normal fit and I put a blanket at the bottom for E to sit on since she is still too small to wrap her legs around me. 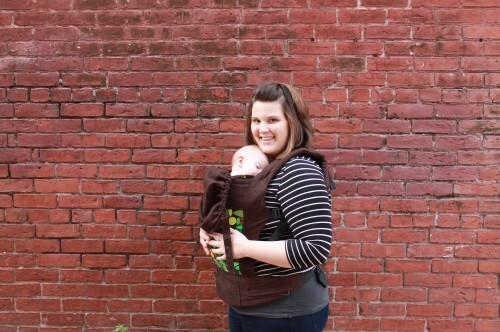 Overall I am a huge fan of my Boba Carrier and I loved my Boba Wrap when E was tiny. Interested in the Boba Wrap or Carrier? Boba is providing my readers with a coupon code for 10% off from now until December 1st, just enter NaturallyFamily10 at checkout! I highly recommend this one but I also love my Boba wrap for when E was first born and I love my ring sling as well. Holly @ Running & Baking Oh my! That is a super cute carrier! All of my kids are way to old for those now, but I have a lot of friends that are building their families. I will be sure to share this with them. I always loved having something to hold the baby and allow me to free up my hands! Great post!! Yes this is one of my favorite carriers- it is so cute too! I love the prints they have available. The Boba 3G Carrier in camouflage is especially good for the men out there. 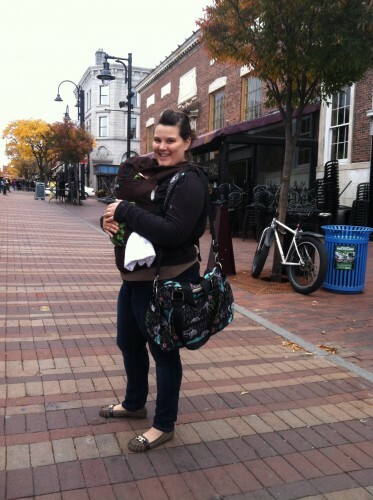 Make you feel a little more “secure” when toting your adorable baby around!